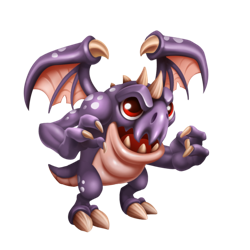 The Ghoul Dragon lives in an underground swamp and only comes out once a year during Halloween, to scare other dragons and steal their candy. His plan fails every year though because everyone thinks he’s adorable, not scary. Ghoul is not Currently Breedable. Sorry. These dragons can all critical hit against Ghoul, but won't be critical hit by Ghoul.